I have a few recipes and some photos to share of My Pink and White Tea. The table was set all pink and white. My friends all arrived to enjoy the day. Each lady selected a tea pot and their favorite tea. I used silver cupcake liners to match my pink, white and silver theme. Oh no, that tea box is starting to look a bit empty! lovely setting, lovely people, lovely photos! Wow, what a beautiful tea party. Please share this wonderful post by joining our linky party, What's it Wednesday this week. I hope you can join us. Have a fabulous Christmas! 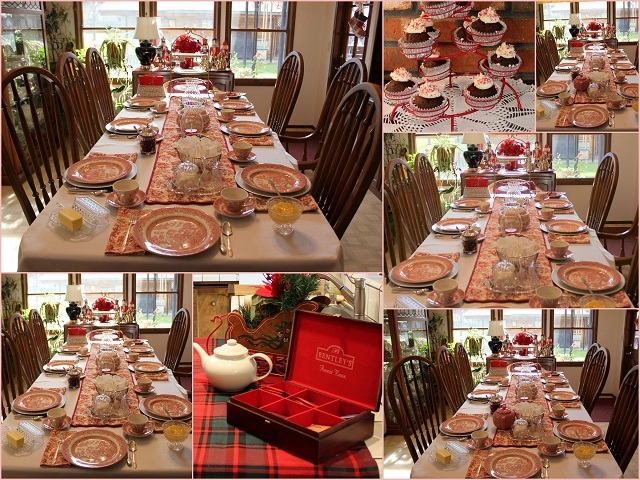 I love tea parties and your party looks like you all had a fabulous time! How lovely, Betty! I have some of those same plates! I hope you had a lovely Christmas and Best Wishes for a Happy & Healthy New Year! Hi! Love your Blog---I visit it 3-4 times a week. Just as an aside note for all of us afternoon tea lovers...Queen Elizabeth II does not allow rectangle tea sandwiches to be made for her at any tea or function she is at...per her Chef. It has something to do with the shape resembling a coffin and it is supposed to bring bad luck or something of that sort to the Monarachy. Sooo Ladies for a proper Tea-cut those corners off! ha,ha! Love everything about your Blog. Keep up your great creative style.